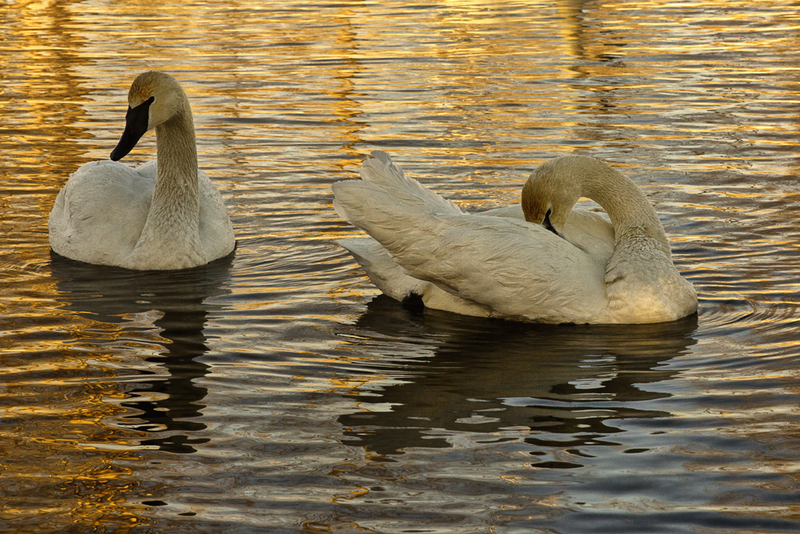 The above photo is the combination of early morning lighting and a good pose by the Swans.I was able to frame this pair of swans with golden reflections in the water.I always try to capture these birds in action,whether it is preening or dipping heads into the water. To get these types of shots means many trips to where the subjects are whether it is wildlife or landscapes.Every trip is different,the lighting changes and there are opportunities for different poses. I shot this photo at 1/125 sec at f10 with a zoom setting of 100mm. 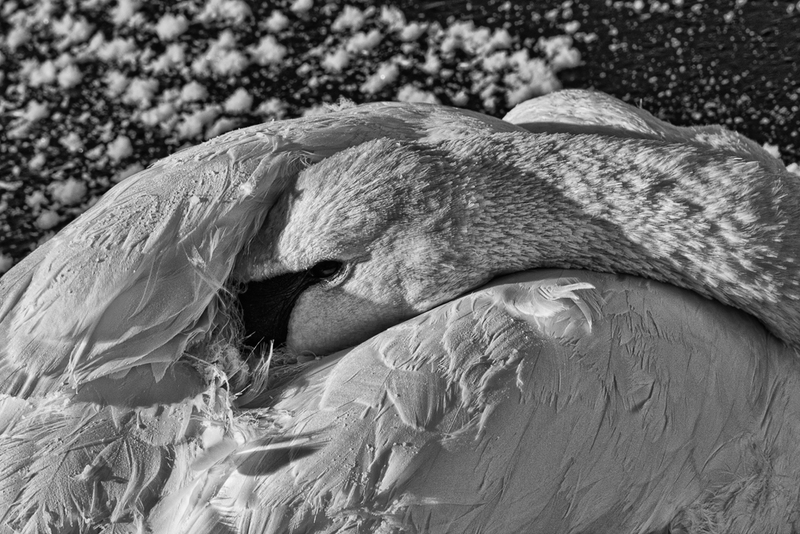 The above photo is a result of the swan coming and laying down beside.I shot this one in a horizontal format to show the curves in the swans body and the intricate detail of the feathers.You can just make out the background that tells you it is frosty and winter time. There is a glint in the eye to add character and I shot this photo at 1/30 sec at f16 with the zoom set to 135 mm.I also converted the above shot to Black and White. I went back to Fielding’s Park the other day but the swans had left.The ice had closed in too much so that the swans could not fly in.I watch a pair of swans fly in once and noticed that they needed a large amount of open water to land. Stunning shots, especially that first one. Wow. 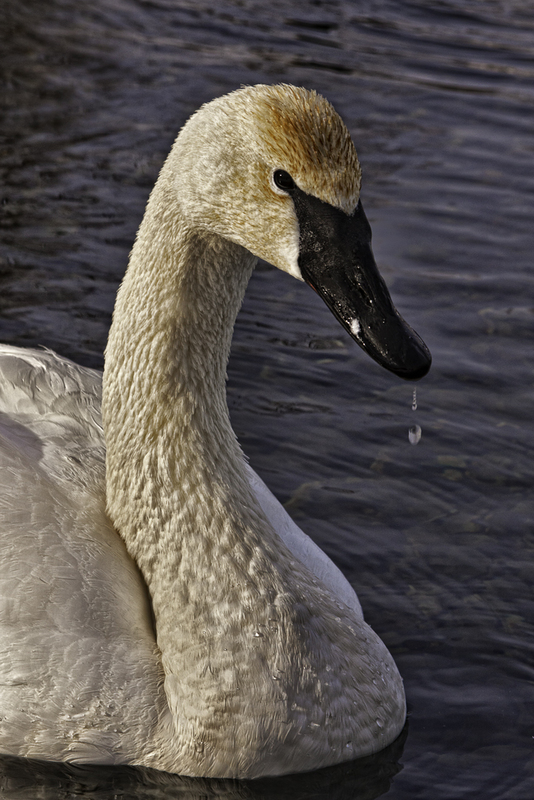 I love the details in the second shot.The textures and tones in the feathers in the neck are great. And as you say, the little spectral highlight in the eye is a must have. Great shot.